My parents converted the downstairs of our house into a bed and breakfast/small apartment. They say it was to earn extra money in the summer, but really it was so my mom would get a full night sleep without having to deal with annoying pre-teen slumber parties. *sigh* I miss that house. Damnit, my library system has book 14 and book 16 but not this one. I blame it for me taking over the newspaper editor’s job in junior high. It’s a shame that I didn’t read this one because I know I would have loved it. 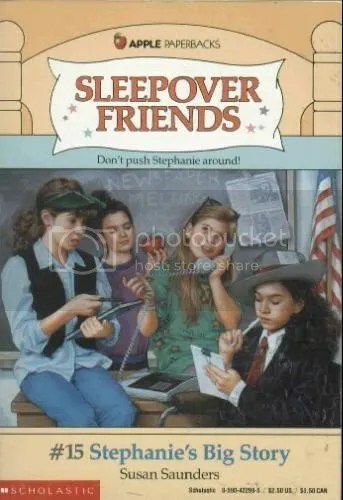 I always loved the covers for the Sleepover Friends..
Is Stephanie the one on the phone in the hat? She totally looks like Michael Hutchence, the late singer from INXS. I didn’t think I read that many of these books, but I guess I must have, ’cause I know I read a few where Stephanie was living outside in her apartment thingy (the fact that it had a kitchenette always blew my mind — I don’t think I would have been trusted with an E-Z Bake Oven in fifth grade!). I totally saw this book at a thrift store the other day (that’s been happening a lot lately). I probably could have read it standing there. I actually remember reading this one and wondering why Lauren’s mom let her eat at all of those restaurants in one day. I think I was kind of jealous. Don’t ask me why. I totally love Steph’s gangster hat!! And over sized suit!! When I wasn’t sneaking out, lots of fun did happen there. I loved Sleepover Friends! Anybody actually remember how the series ended? I love this blog. Sleepover Friends were the coolest. In hindsight, I totally agree about the food issues. I think this is the first Sleepover Friends cover I’ve seen that actually has Stephanie wearing red, black, and white.